&>NOTE: Before purchasing, check with your instructor to ensure you select the correct ISBN. Several versions of Pearson's MyLab & Mastering products exist for each title, and registrations are not transferable. To register for and use Pearson's MyLab & Mastering products, you may also need a Course ID, which your instructor will provide. For Study Skills and Critical Thinking courses. 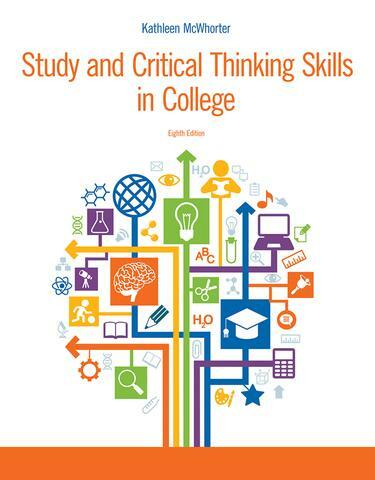 Study and Critical Thinking Skills in College, Eighth Edition aligns closely with the ways students read, study, learn, think, and network in the twenty-first century. McWhorter discusses the active strategies that develop students' proficiency with text and lecture material, emphasizing that students must adapt how they read and how they study to suit the characteristics of each unique academic discipline. Study and Critical Thinking Skills in College also encourages students to study and think in ways that match their learning styles and to use technologies (such as online databases and social media) that maximize their productivity. MyStudentSuccessLab is an online homework, tutorial, and assessment program designed to engage students and improve results. Within its structured environment, students practice what they learn, test their understanding, and pursue a plan that helps them better absorb course material and understand difficult concepts. It fosters the skills students need to succeed for ongoing personal and professional development. Whether face-to-face or online, MyStudentSuccessLab personalizes learning to help students build the skills they need through peer-led video interviews, interactive practice exercises, and activities that provide academic, life, and professionalism skills.